Scenic flight Kathmandu / Lukla / Kathmandu. Magnificent views of great mighty Himalayas. Climb Kalapatthar. 5545m and Everest Base Camp. 5400m. 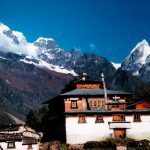 Visit Monasteries including well known Tenboche Monastery. Visit last commercial village in Everest Area. Namche Bazaar with warm Sherpa Hospitality. 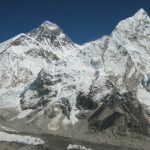 Mount Everest trip from Kathmandu is a Himalayan journey which goes through the eastern part of Nepal. A trek to the base camp of Mt. 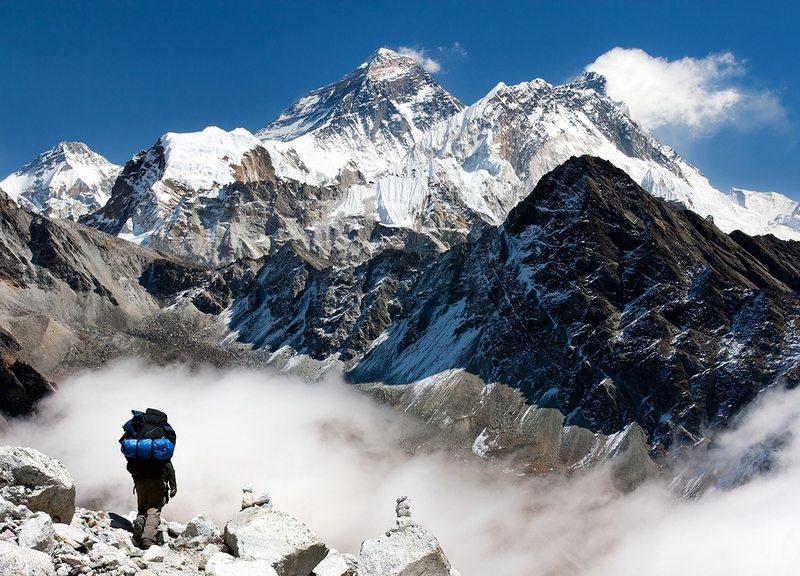 Everest offers trekkers with incredible trekking trails and stunning mountain views. 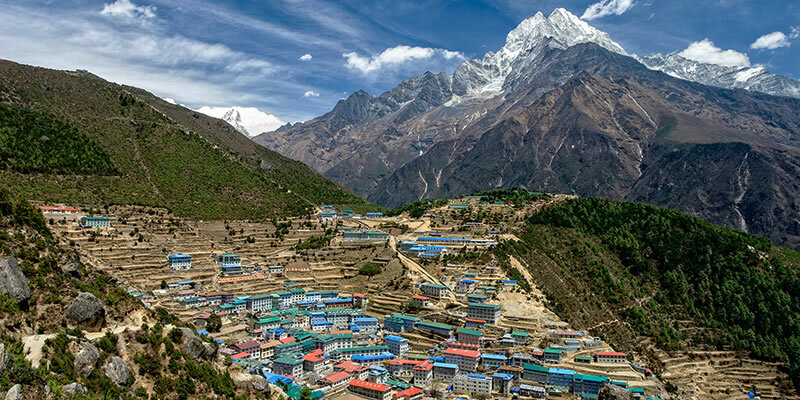 In addition to that, trekkers even get the chance to explore the spectacular Sherpa villages found inside Khumbu region. Our 18 days mount Everest trip from Kathmandu starts by sightseeing Kathmandu valley and the next day you will be leaving Kathmandu city with a flight to Lukla. From this point onwards, trekkers can feel the heartwarming presence of welcoming Sherpa people and their culture. Our trekking trail lets us walk through culturally enriched trails while enjoying close up views of mountains. 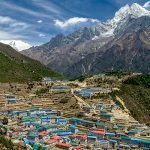 Travelling deeply through the Khumbu region, trekkers experience the unimaginable presence of natural and cultural spectacle while making an attempt to reach the base camp of Mt. Everest (8,848m). From the crystal, clear views of the snowcapped Himalayas to the, everything about the trek is apparently fascinating. Including the crossing of several high suspension bridges covered with Buddhist prayer flags. Moreover, trekkers who walk on these trails get to witness strong white rivers pouring down from the Himalayas. Simply, enjoy visiting fascinating local villages coexisting together with the diverse indigenous flora and fauna. Relish the joy of watching the jaw-dropping scenery of colossal glaciers. And last but not the least witness a close-up view of Mt. Everest along with other Himalayan mountains from the top of Kala Patthar (5,545m). 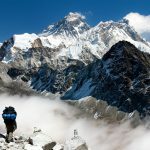 Contact Euro-Asia Treks right now and join our Everest summit trek in 2019! 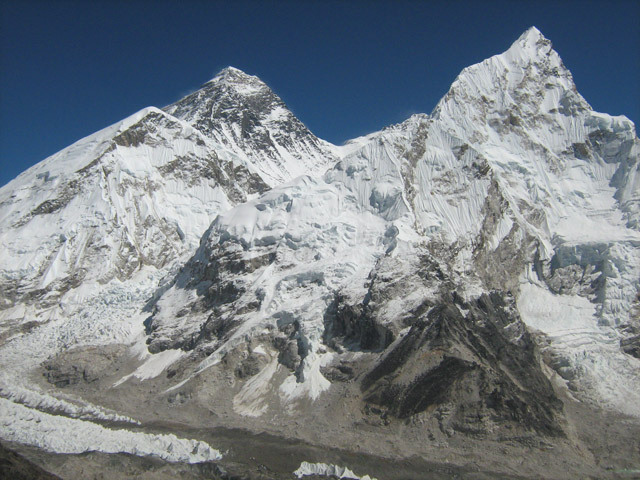 Check More Information for Everest Base Camp Trek in our link. Waking up with a blissful joy of excitement, we experience our first morning in the heartland of the Himalayas. Soon after finishing our appetizing yet nutritious breakfast, we move down from Phakding and tumble our way towards Bhotekoshi River. Next is the small village of Jorsale which will be reached after crossing a high suspension bridge and walking for about 2 hours alongside a striking trek trail. Before marching forward, we will need to check out our trekking permits at the Sagarmatha National Park check post which is located at Jorsale village. Upon finishing our official formalities, we continue on with our trek and enter the stunning Sagarmatha National Park. Now our trail drops gently down to a long suspension bridge covered with fluttering Buddhist prayer flags. After crossing this bridge, we shall walk for another 2 to 3 hours on a steep Himalayan terrain and later arrive at the outstanding Sherpa town of Namche Bazaar. Stay overnight at Namche Bazaar. As scheduled, today we are planned to stay at Namche Bazaar for acclimatization purposes. Situated at a high altitude of 3,450 meters above sea level, Namche Bazaar is the perfect place to help our bodies acclimatize and adjust to the environmental changes of such high altitudes. Due to change in weather, altitude and the rigorous exercise of walking terrains, a day is taken off the schedule for trekkers to rest and enjoy the sites around Namche Bazaar. During this day, trekkers can hike little up towards the Everest View Hotel for spectacular views of Mt. Everest and Mt. Ama Dablam alongside others snowcapped giants. Lastly, the major aim of this day is to prevent any possible symptoms of High Altitude Sickness which may hamper the remaining trek days. As the sun shines over the beautiful hills and valleys of Khumbu region, you need to wake up and have your breakfast as we plan on leaving Namche Bazaar today. Following a trail that traverses from Choi Gang to Kyanjuma Foundation, we descent down to a suspension bridge across Dudh Koshi River. After crossing the bridge and passing a few tea houses en route, the trail reaches Phunki Thanga. Pointing towards the next destination, pleasant walk uphill begins that goes through a blended trail of forest and shrubs. And you are lucky then you can even get to spot Pheasants, Tahr and Deer along the way. At the end of the climb, you will reach Kani which is an arched entrance with ceiling paintings of deities and forms of Lord Buddha. Three hours later, trekkers arrive at Tengboche village and are bountifully presented with one of the best glimpses of Mt. Everest, Mt. Amadablam, Mt. Nuptse, Mt. Lhotse & Mt. Thamserku, Moreover, the largest Buddhist Monastery of Khumbu region lies here so you may even go and visit the Tengboche Monastery. Day seven begins with a trek trails that goes along a gently sloping track, which then climbs up and starts becoming steeper with each step. Following the trail ahead, trekkers move past a few small dwellings and a forest which will slowly take trekkers towards a lovely village called Pangboche. 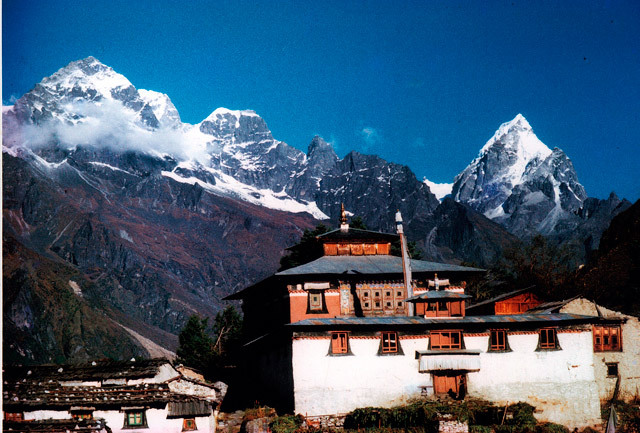 Being small Sherpa village, Pangboche is renowned for its eccentric Buddhist Monasteries. Continuing on with our trek, we walk through the beautiful meadow fields, several tea houses and ultimately reach Pheriche, after 3 hours of trek from Pangboche village. You have to keep in mind that while trekking at very high altitude, your body tires out faster and needs time to recuperate itself. Hence, just like Namche Bazaar, we are going to stay in Pheriche for the day being and give our body the much-needed rest which it solely deserves. It is a free day so either you can rest or roam around the surrounding areas of Pheriche village. That is totally up to you. But we suggest going out and enjoying the natural surroundings while taking memorable photographs will be more enjoyable than just sitting inside your lodge/tea house. As usual we are going to wake up early and have our breakfast. Then we begin heading out through meandering trails towards Lobuche. The branching of a trail track on the left of the main trail sets off directly towards the bridge to Tukla over a few slippery boulders, while the main trail converges with the trail from Dingboche, minutes before reaching the bridge to Tukla. The onward journey then continues with a climb over the ridge behind Dingboche. Following one of the many trails to the elevated plain, the trek gets tougher as we hike up for nearly 3 hours. Later, we shall reach our final destination of Lobuche village. Today the entire trek duration can be around 7 to 8 hours as we plan on climbing up to Kalapatthar and return back to Gorakshep. Due to which, this day is going to be longest day of our entire trek. Marching ahead, we ascent up through a rocky trail towards Gorakshep. And after walking for about 4 hours, we shall reach Gorakshep. Beyond Gorakshep, the demanding climb on the steep terrain towards Kalapatthar begins, which my take us about three hours to complete. Nevertheless, upon reaching the top of Kalapatthar, we are offered with a magnificent Himalayan view which includes the majestic Mt. Everest and its surrounding area. So, don’t forget to click a picture of yourself with the highest mountain of the world as your background. Lastly, after enjoying the view, we descend towards Gorakshep for about an hour. The most memorable and highlighted day of our entire trek has finally arrived. It’s day eleven and now we make our final steps to reach the incredible Everest Base Camp which is situated at a high elevation of 5,400 meters above sea level. Following a yak trail, we pass through beautiful yak meadows and the colossal Khumbu Glacier while on our way to the EBC. After arriving at the base camp, you can have complete rest and then roam around to closely observe the base camp area while taking many memorable photographs of your achievement. Here onward the ends with the return trek to Lobuche. Starting from today, we have now reached our final phase of the trek and so we are going to start making our way down all the way to Dingboche village today. All in all, it can take us nearly about 4 hours to reach Dingboche village from Lobuche. While heading down, you may experience the air getting thicker and thicker as the trek route descends lower down from Lobuche. Crossing the bridge from Tukla along the path previously followed for our ascent, we reach at Dingboche village where we are going to end our trek by enjoying the delicious Nepalese cuisines before going to sleep. Similarly, like yesterday, today is also all about retracing our steps back down. Hence, after finishing our breakfast, we carry our bags again and continue trekking down to Tengboche village. During our descent, we will be passing through Pangboche and Deboche villages. Later after walking for about 3 – 4 hours from Dingboche, we shall arrive at our final destination of Tengboche village. Comparatively speaking our trek is going to mostly follow a downhill trail. From this point onward, trekkers can breathe more easily and comfortably as we get lower & lower with each passing step. Later after 5 hours of walking, we arrive at the lively Himalayan town of Namche Bazaar. Leaving Namche Bazaar, we are going to follow our previous trek route towards Phakding village. But before that you can go for a short stroll around the market areas of Namche Bazaar and do some souvenir shopping for your friends & families back home as you will be leaving Namche Bazaar shortly after. Continuing our descent, we pass through several high suspension bridges and densely forested trek trails. And upon reaching Phakding village, we are going to take rest for the remaining day. Day sixteen marks the final day of your trek. After beginning the return trip from Phakding, a journey of about four hours in the wilderness takes you to Lukla. You take the rest of the day for yourself and enjoy the beautiful scenery in the area. Lastly don’t forget to treat yourself with the local cuisine while experiencing the Nepalese hospitality. Today we are going to take a flight back to Kathmandu city from Lukla and end our 15-day Everest Base Camp Trek. After landing at the domestic airport of Kathmandu, a representative of Euro-Asia shall transfer you to your respective hotel room. Later in the evening, enjoy Farewell Dinner. Hotel transfer by Private Vehicle. 15 Days trek as per program with English Speaking Sherpa Guide and Porter. Sagarmatha National Park Fee and TIMS Fee.